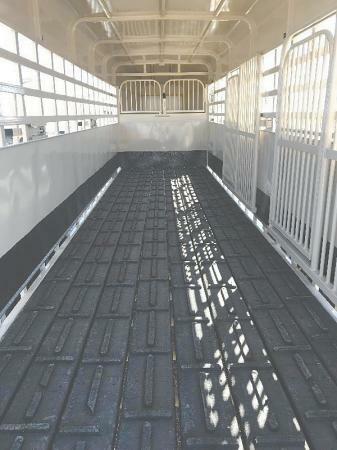 High friction rubber flooring can keep your livestock standing and also extend the life of your trailer, says Shelby Trailer Service, a small family owned and operated trailer flooring manufacturing company located in Comanche, Okla. All their products are made entirely from recycled tire rubber and plastic. The flooring comes in ready-to-install boards that measure 8 in. wide by 2 in. deep and can be cut to any length. Their original Cross Lug board is designed to keep livestock standing while on the move. Introduced in the late 1990’s, it has been improved by providing spacing between the cross lugs for easier cleanout. The company recently introduced a smooth, 1 1/2-in. thick Tongue and Groove board made with “traction surface” and a 1 3/4-in. thick plank board. Both boards are designed for horse trailers, equipment trailers, flatbeds or truck beds. “The plank board works great on heavy equipment trailers used to haul backhoes and tracked equipment,” says Olah. Besides rubber flooring, the company also offers a 3-in. thick solid rubber rear bumper for trailers. “If you back up with a trailer and accidentally hit a dock, our solid rubber bumper won’t crack like hollow bumpers on the market,” says Olah. Shelby rubber lumber comes with a 20-year warranty. The price to re-floor a trailer starts at $500 and goes up depending on the size of your trailer.